Raptors Plan To Make Push for Anthony Davis, But What Will it Take? There are reports that the Toronto Raptors are willing to make a push for Anthony Davis. In other news, so are 29 other teams in basketball. Joking aside, unlike many teams, the Raptors may present one of the more favourable packages for Davis and realistically speaking, trading for a year and a half of Davis just makes a whole lot of sense for a team looking to win now. With Kawhi Leonard in his walk year, the uncertainty around Leonard re-signing has been up in the air from the moment he arrived north of the border. With that in mind, if Masai Ujiri was willing to take one big risk for a shot at winning a championship back in the Summer of 2018 – it may be time to go all in right now. The Trade Deadline is on February 7 so Ujiri and his general manager Bobby Webster have just over a week to appease to the New Orleans Pelicans. One thing to keep in mind as well, the “Derrick Rose Rule” may prohibit the Boston Celtics from being involved in Davis trade talks so if the Pelicans are to see all the top offers presented to them all at once, they may be hesitant to trade Davis until the Summer. The rule should not stop the Raptors from making a push for the big fish on the trade market. Right off the bat, Serge Ibaka will need to be involved. His $21.6 million contract will be key to helping salary not turn into an issue if a potential trade is to go down. Having an extra year of term following this season will provide the Pelicans with a valuable trade chip in the form of Ibaka’s expiring contract next season, while providing them with plenty cap relief in 2020-21. When a team is committed to a rebuild, there are three things that become of utmost importance – cap relief, draft picks, and young players. The trade takes care of cap relief and with the additions of O.G. Anunoby, Delon Wright, and Norman Powell, the Pelicans immediately acquire an influx of youth and controllable assets. Of course, the Raptors may also need to include one or two future picks (more than likely their 2020 first round pick), which for an opportunity to win and hold onto Anthony Davis for two more years past this season is easily worth their while. 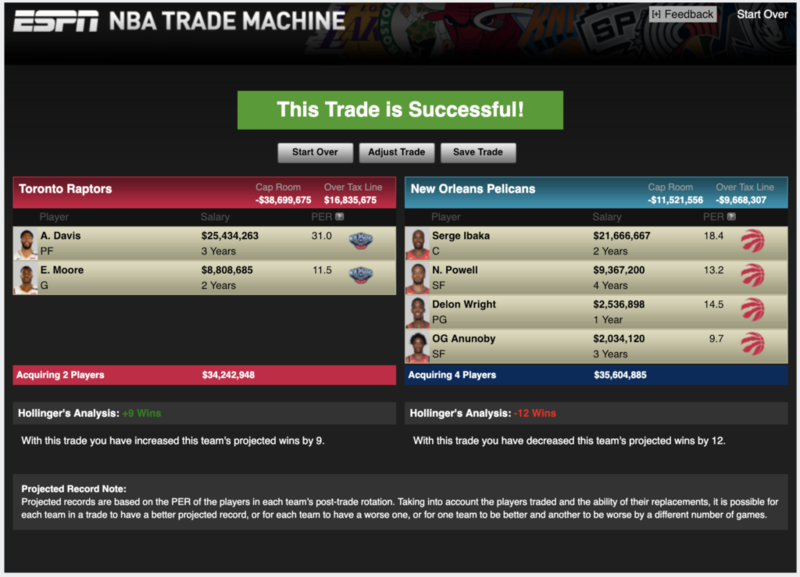 Additionally, as the Pelicans are looking too shed more cap and the Raptors are looking for more shooting depth, including E’Twaun Moore in a hypothetical trade would make a lot of sense for both sides. As Moore is not slated to enter free agency until next offseason, his $8.7-million dollar contract will allow the Raptors to move on from C.J. Miles in the offseason, while holding on to a viable shooting option for the second unit. With Danny Green set to become a free agent this offseason as well, Moore’s importance to the team will only continue to go up. Time for Masai Ujiri to try to make it happen!